Chef Dennis Chan, the culinary creator of Blue Bamboo restaurant in Jacksonville, FL., and the book, Hip Asian Comfort Food, rarely does the expected. Chef Dennis Chan whisks up some cotton candy for cocktails. 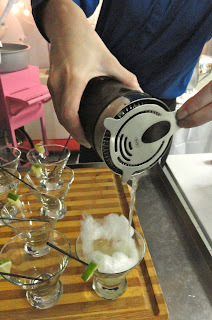 So when he invited a group of food writers and bloggers by for a tasting, Chef Dennis began with a new drink, his classic Cucumber-Lime Saktail with a twist, vodka instead of sake and cotton candy (!) instead of simple syrup. This Kicked-Up martini was surprising and surprisingly good. We soak, fill and fold. Little did we know we'd be preparing some of our meal, beginning with Fresh Unfried Spring Rolls with Vietnamese Peanut-Hoisin Dipping Sauce that could make shoe leather edible. Fill and fold was simple enough and the next course, Seoulful Edamame, was already put together. Good thing because we were soon too busy eating to even think about cooking. Here are the recipes for the Kicked-Up Martini and Seoulful Edamame. Begin by filling a glass with cotton candy. Muddle lime and cucumber in bottom of a shaker. Add ice, vodka and syrup and shake well. 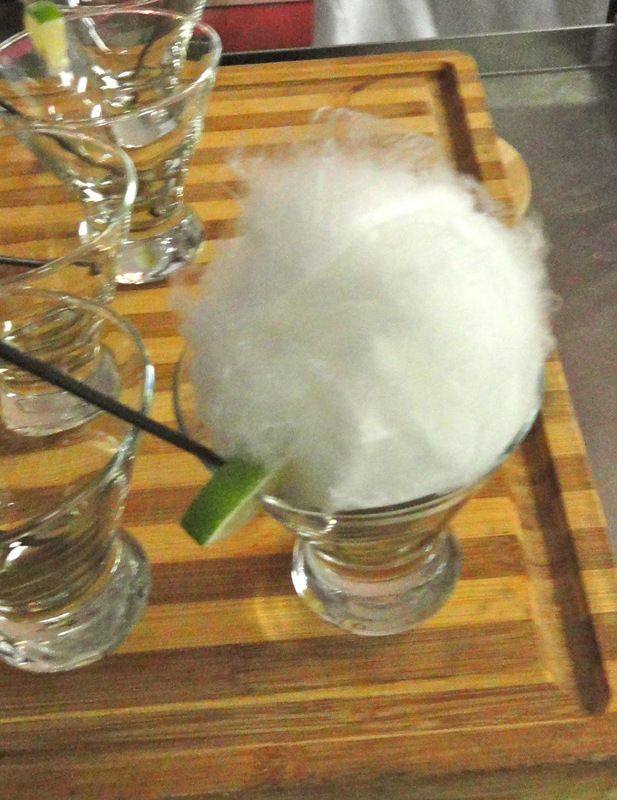 Pour over cotton candy in a chilled glass and garnish with a lime wedge. Stir. Cotton candy will dissolve. 1 lb. frozen edamame, shell on. Whisk all ingredients for BBQ sauce. It comes out spicy so you might want to add the hot pepper paste a tablespoon at a time. Can be made a few days ahead and stored covered in the refrigerator. Boil edamame until tender. Toss in salt then sauce. Garnish with sesame seeds and serve while warm. Kuchen comes with a variety of fillings. Kuchen is the South Dakota state dessert and if any are "the" kuchen, everyone says you'll find them in Eureka. Recipes for it were brought here by German and Russian German immigrants in the 1870s. 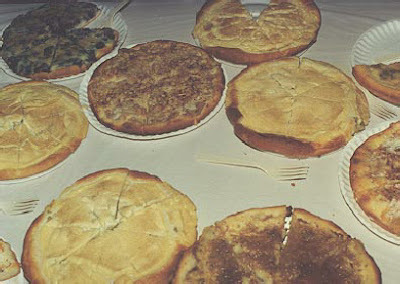 Basically, a cake-like custard pie, kuchen can have a variety of fillings, usually custard and/or fruit, fresh, canned or dried and plumped. This version is from the Germans from Russia cookbook available for sale from the Eureka Pioneer Museum. Dissolve yeast and sugar in lukewarm water. Scald milk. As it cools, add shortening. When cool, stir in eggs and salt. Add flour and mix well. Add water with yeast and sugar. Mix to an elastic dough, adding as much flour as necessary (3 cups won't hurt) to make it soft and pliable. Set in warm place for 45 minutes. While waiting, make the filling. Filling. You may use any kind of fruit, remembering to add plenty of sugar if fruit is uncooked. A wonderful tangy blend is 3/4 scalded rhubarb and 1/4 raisins. Or you may use prunes, cooked and pitted. Another excellent combination is 3/4 cup cottage cheese blended with 4 TBSP. sweet sour cream, 1 egg, and 1/2 cup sugar. One favorite is made of even parts of butter, sugar, and peanut butter with 2 parts of flour. Knead dough after 45 minutes and put in back in warm place for 30 minutes. Knead again, place on well-floured board and roll to thickness of about 1/4 inch (not thin). Line well-greased cake tins, bringing dough about 3/4 of the way up the sides of the tins. Brush with melted shortening and place in warm place for 1 to 1 1/2 hours, or until pastry is raised. The Outdoor Campus, Sioux Falls, S. D.
Thea Miller Ryan, travel writer and director of The Outdoor Campus in Sioux Falls, S. D., introduced me to Smacos, a south of the border, slightly tidier version of the campfire classic S'mores. "It's a big hit with folks who love to camp or have a fire pit in their backyards," said the woman who runs this fabulous hands-on center that introduces South Dakotans to the outdoors and how to enjoy it. You don't need a pit, just take the grill off the barbecue and throw them on the coals. The kids will love it. Ready to roll, fold, foil and heat. Spread the tortilla with peanut butter. Top with 2 tsp. chocolate chips followed by about 15 small marshmallows. Roll and fold the tortilla then roll it up in aluminum foil and seal well. Put on embers or charcoal for 30 seconds on each side (more or less depending on the strength of the coals). Not ready yet; put it back on the coals until chocolate and marshmallows are melted. Eat and enjoy when it's ready!